The International at Kester witnessed Shaun back fighting for podium positions and then the ninth round of MXGP saw Matterley Basin again host the British Grand Prix and the Scot returned to the world stage for the first time since a rib and hip injury sustained in practice during the Russian GP last month. A dry and sunny Matterley, close to the town of Winchester and back staging top flight racing after a muddy 2017 Motocross of Nations in October, allowed Shaun to head back to the UK with the goal of picking up his fitness, form and pace at the highest level. Basking in the temperatures and with the support of the Simpson Army, many fans and friends, the former multi-British Champion had some ups-and-downs through the weekend. An early fall in the first moto on Sunday cast him outside the points-scoring positions but then a better start and entertaining tussle with countrymen Tommy Searle and Max Anstie in the second race led to a top twelve classification and fulfilment of a small pre-race goal. 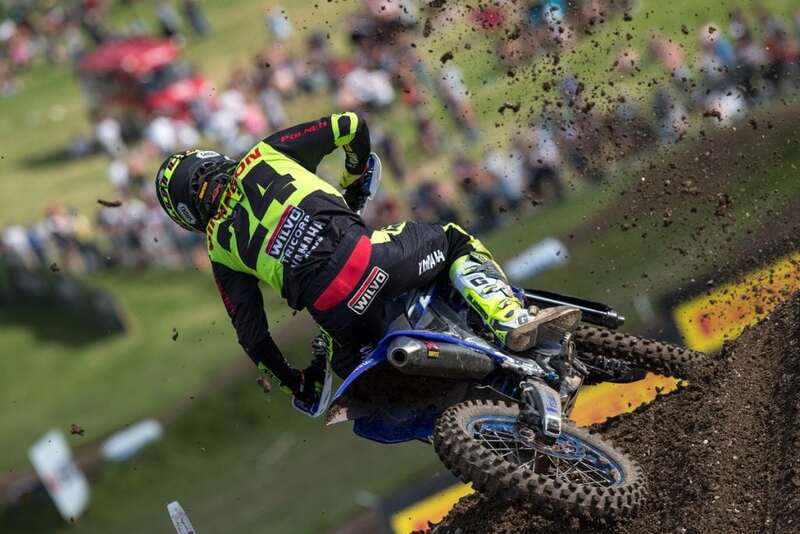 Wilvo Yamaha had straight to the hillside venue of St Jean D’Angely for the Grand Prix of France this weekend.